Fine Art Photography from Yosemite National Park. Yosemite National Park in the Sierra Nevada Mountains of California is one of the most renown and visited parks in the United States. During the winter months, the park enjoys a relative serenity from the summer crowds, which are typically deterred by the relatively inclement weather. The images presented on this page were all taken at the beginning of February 2001, shortly after a storm dropped over a foot of snow on the valley floor. One month later, an unusually cold and wet storm dumped about five feet of new snow on the valley. About seventy-five percent of the park's precipitation typically falls from November through March. In the upper reaches of the park, this is almost entirely as snow, whereas in the valley, both snow and rain will fall. January and March are the snowiest months with an average snowfall of just over 16 inches in each month. December and January are the coldest months with average lows of 26oF (-3oC). The record low temperature for the park (measured in the valley) is a chilly -1oF (-18oC). 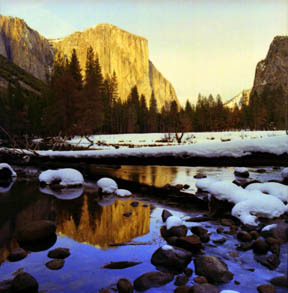 This is the classic view of El Capitan from the Merced River in the valley. 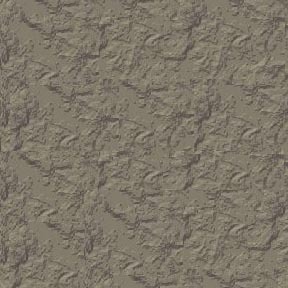 It is not unusual for the reflected image to produce a richer, deeper hue than the true image. This image was taken from just northwest of the Vernal Fall footbridge. 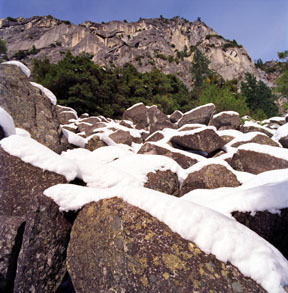 The snowcap helps to define the chaotic nature of granitic blocks that tumbled into position in the talus slope. 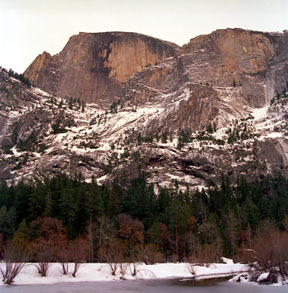 Taken from Mirror Lake, this is the view up at the sheer face of Half Dome. About every 10 minutes or so, a thunder-like rumbling can be heard sweeping across the valley as the daily freezing and thawing action causes minor rock slides. These slides mix with snow accumulations and cascade down the steep face of Half Dome. One such avalanche can be seen as the white vertical streaks in the upper right portion of the image. 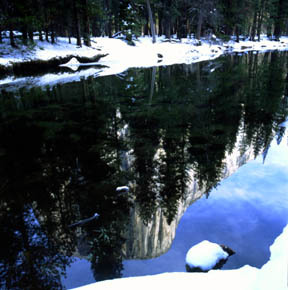 Lying at the foot of Half Dome, this lone granitic block rests partially submerged in Mirror Lake. As the lake is slowly filling in with sediment and gradually becoming a meadow, this reflection is very temporary in geologic time. This was taken from a point where the Merced River is accessible at its closest point to El Capitan. 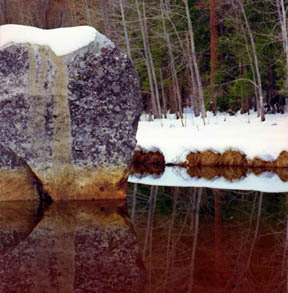 A polarizer was used to permit the reflection of the monolith while allowing for some portions of the riverbed to be visible through the darker portions of the reflection.